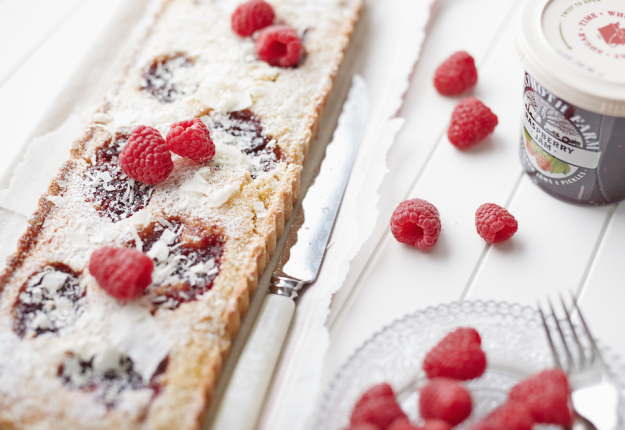 This frangipane and raspberry tart recipe was developed by @ironchefshellie. MAKE THE PASTRY - add flour, butter and icing sugar in a food processor, and process until the mixture resembles fine breadcrumbs. Add the egg yolk and water. Process until the dough just comes together. Turn onto a lightly floured surface. Knead until just smooth. Shape into a disc. Cover with plastic wrap. Place in the freezer for 30 minutes to rest. Turn the pastry onto a lightly floured surface. Use a lightly floured rolling pin to roll out to a 3mm-thick rectangle. Line a round or rectangle fluted tart tin, with removable base, with the pastry. Trim any excess. Prick the base with a fork. Place in freezer for 30 minutes to rest. Preheat oven to 200°C (180°C fan-forced). Line the pastry case with non-stick baking paper. Fill with pastry weights or rice. Bake for 12 minutes. Remove paper and pastry weights or rice. Cook for a further 7 minutes or until golden. Turn oven down to 180°C (160°C fan-forced). FOR THE FRANGIPANE FILLING, beat the butter and sugar together until light and fluffy, then beat in the eggs one at a time. Stir in the flour, ground almonds and the almond extract. Spread frangipane filling over the base of the pastry case and add teaspoons of Anathoth Farm Raspberry Jam over. Bake for 20-25 minutes, or until filling is golden. A beautiful looking tart that would be absolutely delicious,thanks! Oooh la la, this looks very special. This looks so yum, I don’t think mine will turn out the same but I’m going to give it a go! I’ve always wondered why they call it a Frangipani tart? Either way this looks like it would be prefect for afternoon tea. Very nice! Thanks for sharing this recipe! yep this is my weekend bake – I don’t have to buy any ingredients! this looks and sounds just simply devine! what a treat! This looks sweet and delicious! Thanks for posting! This looks sweet and delicious. And rather fancy. I’ll pull it out for impressing guests.